Discover the curiosities of one of L.A.'s most unusual attractions: the La Brea Tar Pits and Museum with this admission ticket. Enjoy this unique experience which helps unlock the local mysteries of the Ice Age. 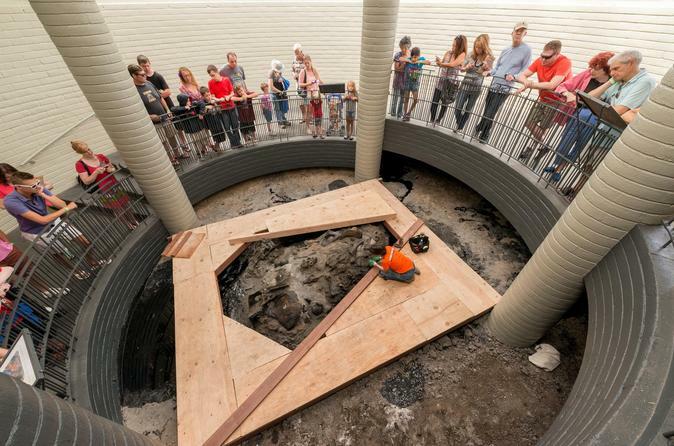 Visit an active Ice Age dig site and watch paleontologists excavate millions of fossils before your eyes. From microfossil sorting to cleaning fossil bones — it's all done right inside the museum. Use your general admission ticket for entry to the La Brea Tar Pits and Museum. Here, Ice Age fossils are being excavated right in the middle of L.A. Enjoy this truly unique attraction by experiencing all that it has to offer. Marvel at its outdoor Lake Pit, oozing with bubbling tar; travel back in time among the prehistoric plants of its Pleistocene Garden; and explore its active dig sites, where it seems excavators uncover something new daily. The museum itself features its own wealth of offerings. Scope out the fossils of prehistoric mammoths, saber-toothed cats, wolves, and ground sloths, or take an opportunity to watch paleontologists working in the Fossil Lab on their most recent finds. For a wonderful overview, reserve a spot on the Excavator Tour, free with admission. This guided tour delves into the history of the tar pits and explains just how so many massive creatures ended up stuck here. You’ll also visit the Fossil Lab, Observation Pit and Project 23, where excavators are continuously helping to unlock the mysteries of prehistoric L.A.